Literally speaking, a “sound” refers to a pressure fluctuation of the air. This means, for example, the sound of a bus passing means our ear senses the pressure fluctuation or pressure variation the bus created. During our daily lives, there are rarely significant pressure fluctuations in the air above common noises, but in special cases it happens. Windows are commonly featured in movies breaking from someone screaming loudly or in high pitches in the movie. This is usually exaggerated, but not out of the realm of what is physically possible. The pressure fluctuations in the air caused by sound can cause engineering problems for loud structures such as rockets, especially given that the pressure nature of the sounds waves that means louder sounds result from larger pressure fluctuations and can cause more damage. 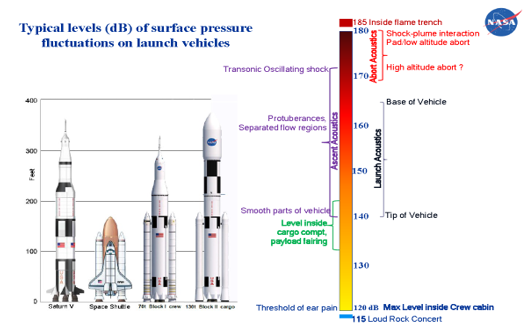 Rocket launches are particularly loud and the resulting pressure change in the air can affect the surface of the launched vehicle as the form of the force shown as Figure 1. As the vehicle is launched (Figure. 2),it reaches volumes over 180dB, which corresponds to about 20,000 Pascals in pressure change. This pressure change is about 20% of atmospheric pressure, which is considered very large. Because of the pressure change during launching, communication equipment and antenna panel can incur damage, causing the malfunctioning of the fairing, the protective cone covering the satellite. In the engineering field, the load created by the launching noise is called acoustic load, and many studies are in progress related to acoustic load. 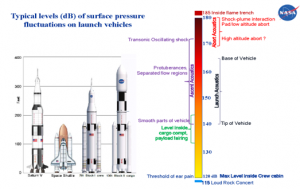 Studies focused on the relationship between a launching vehicle and its acoustic load is categorized, to rocket engineers, under “prediction and control.” Prediction is divided into two aspects: internal acoustic load; and external acoustic load. 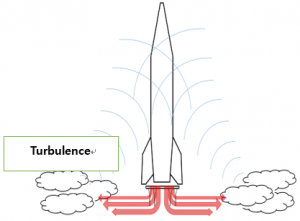 Internal acoustic load refers to sound delivered from outside to inside, while external acoustic load is the noise directly from the jet fire. There are two ways to predict the external acoustic load, namely an empirical method and numerical method. The empirical method was developed by NASA in 1972 and uses the collected information from various studies. The numerical method employs mathematical formulas related to noise and electric wave calculated using computer modeling. As computers become more powerful, this method continues to gain favor. However, because numerical methods require so much calculation time, they often require the use of dedicated computing centers. Our team instead focused on using the more efficient and faster empirical method. Figure 3 shows the results of our calculations, depicting the expected sound spectrum. We can consider various physics principles involved during a lift-off, such as sound reflection, diffraction and impingement that could affect the original empirical method results. Meanwhile, our team used a statistical energy analysis method to predict the internal acoustic load caused by the predicted external acoustic load. 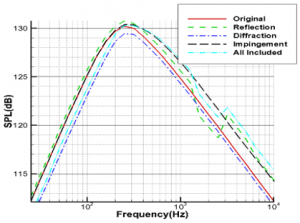 This method is used often to predict internal noise environments. It is used to predict the internal noise of a launching vehicle as well as aircraft and automobile noise. Our research team used a program called, VA One SEA, for predicting these noise effects, shown as figure. 4. After predicting internal acoustic load, we decreased the acoustic load to conduct an internal noise control study. A common way to do this is by sticking noise-reducing material to the structure. However, the extra weight from the noise-reducing material can cause decreased performance. To overcome this side effect, we also conducted a study about active noise control, which is in progress. Active noise control refers to reducing the noise by making antiphase waves of the sound for cancelling. 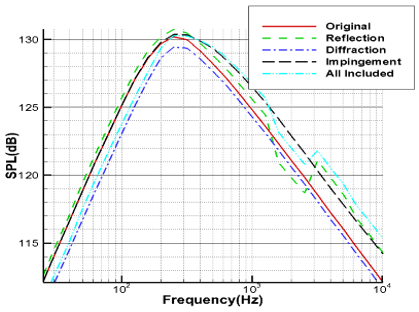 Figure 5 shows the experimental results of applied SISO Noise Control, showing the reduction of noise is significant, especially for low frequencies. 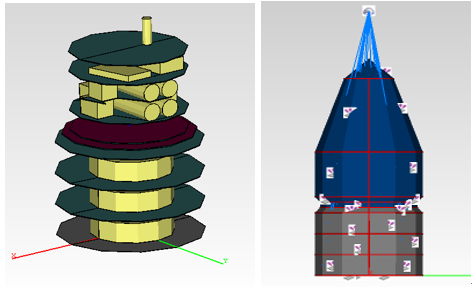 Our research team applied the acoustic load prediction method and control method to the Korean launching vehicle, KSR-111. Through this application, we developed an improved empirical prediction method that is more accurate than previous methods, and we found usefulness of the noise control as we established the best algorithm for our experimental facilities and the active noise control area.